It is my pleasure to welcome romance author, Roxy Boroughs to Conversations today. She's here to talk about her sweet romance Christmas novella, HOME FOR CHRISTMAS, book two of ‘A Frost Family Christmas’ trilogy. So, check out the cover, blurb, and excerpt. And get to know Roxy by checking out her interview too! And be sure and leave a comment because Roxy's giving away a Kindle ebook of the first novella in A Frost Family Christmas series, WHAT CHILD IS THIS by C.J. Carmichael. This holiday season, April Rochester must decide if her first love is merely “Home for Christmas” – or home for good. James Frost, the black sheep of the family, is back in Carol Falls, Vermont, to build a big box store and prove he’s a success. His plans derail when he learns his high school sweetheart has moved back to town also, along with her autistic son, Marcus. Ten years ago Jimmy and April eloped, only to be torn apart when April’s parents insisted on an annulment. Their love for each other never died, however, and this could be their second chance. But James has been hiding behind a mountain of secrets, one of them involving baby Holly, the abandoned child recently found at the family farm. And all of James’ well-kept secrets are about to come tumbling down. HOME FOR CHRISTMAS, a 40,000 word sweet romance novella, is Book Two of ‘A Frost Family Christmas’ trilogy. Each novella is a complete romance with a linking mystery connecting the three books. Want a little mystery along with your holiday romances this Christmas? Then visit the Frost Family in Carol Falls, Vermont and enjoy these three heartwarming novellas. James nosed his car into the long driveway and parked. As he walked down the cracked sidewalk, movement caught his eye. Close to the house, on the other side of the peeling picket fence, April’s snowsuit-clad son was busy with his toys—a toboggan, a pintsized snow shovel, a green bucket and a plastic Superman chair. The boy seemed like an average kid, until James took a second look. Marcus wasn’t actually ‘playing’ with his toys. He was lining them up. Meticulously. The child didn’t acknowledge him, just went right on placing his things in a row, howling in aggravation each time the shovel he’d stuck in the snow fell over. He’d been so intrigued with Marcus, he hadn’t noticed April’s approach. “Considering the time of year, maybe I should get one like Santa’s,” he replied. Her hat was a teal knit, the same color as her car-length coat. The material almost matched the shade of her eyes. He’d often gazed at her, trying to decide if they were blue or green. Depending on what she wore, and her mood, her eyes seemed to change—blue if she was overtired, green if she was excited. Always green after a thorough kissing. He heard a hiss and snapped out of it. At his feet, a well-fed black and white cat stared up at him, indignant. A dark mask of fur ran around the feline’s eyes, making him look like a chubby Zorro. Bandit batted the air with his paw, clearly a challenge for James to put up his dukes and fight it out. Mano-a-mano. Weird. Animals usually liked him. Kids, too. James felt like Tiger Woods at the 2013 U.S. Open. Completely off his game. He glanced over at Marcus again, who was now making snowballs. Instead of throwing them, he was stacking the balls one on top of the other like a mile-high ice cream cone, shouting his frustration whenever they fell over. She licked her lips, drawing James’ attention to them all the more. He could still remember kissing her. She’d tasted like cherry bubblegum, smelled of shampoo, and the sight of her pulse beating madly at the base of her neck used to be enough to drive him over the edge. He cleared his throat. Unfortunately, it did nothing to clear his head. “Where’s the boy’s father?” He shouldn’t ask, but couldn’t stop himself. A part of him wanted to see the guy pull his weight. A bigger part wanted the guy out of the picture entirely. For selfish reasons. All of which involved April and that luscious mouth. James’ expression turned hard, possessive. And that hungry look in his eyes set April’s heart kicking against her ribs with the fervor of a wild bronco. So was his jaw, dusted with the right amount of stubble to give him an air of danger. She wanted to reach up and touch his cheek, let that roughness caress her palm. Was she crazy to feel this attraction to him after all these years? Whatever he’d done to send her teenage endorphins skyrocketing tripled now that he was a man. And that spiced-up cologne he wore? She wanted to bury her face against his neck and breathe him in for the next half hour. “I manage,” she said, took a step back and grabbed hold of one of the fence slats—something solid to remind her about the differences between reality and fantasy. The wood was reality. Marcus was reality. Making this month’s credit card payment was a harsh reality. Hi, Lisa. Thanks so much for inviting me here today. I live in Calgary, Alberta and, at this time of year, it’s lovely to look out my window and see snow on the Rockies. That certainly gets me in the mood for the holiday season. What made you decide to write books in your particular genre? Actually, Lisa – you inspired my latest book, HOME FOR CHRISTMAS. I read your ALL I WANT FOR CHRISTMAS IS YOU, and I thought I’d write a heart-warming holiday story, too. A series, actually. So I approached a couple of writer friends to do a trilogy with me. Each book is a complete sweet romance, featuring a sibling from our fictional Frost family of Vermont. A mystery sub-plot connects all three books. In the first novella, WHAT CHILD IS THIS by the award-winning C.J. Carmichael, an abandoned baby is found in the manger of the Frosts’ nativity scene. My story features Jimmy Frost, the black sheep of the family, and continues the mystery of the baby. The plot lines conclude with Brenda M. Collins’ book, THE HOLLY & THE IVY. In that novel, Joey, the youngest Frost, who happens to be a female police officer, is assigned to the case. For this series – set in the fictional town of Carol Falls, Vermont – we wanted each title to be a Christmas carol. We spent hours going through lists of Christmas songs, looking for the right fit. For other books, the title comes later. My romantic comedy, CRAZY FOR COWBOY started out as THE COWBOY WHO NEVER SAW A COW. That was a little long for the cover, but worked well with the story, since the hero is an actor who’s been hired to play a cowboy in a movie. During the course of that book, he has to learn how to be a real, as opposed to a reel, cowboy. Do you decide on character traits before writing the story or as you go along? For my hero in HOME FOR CHRISTMAS, I started with the idea of the Prodigal Son Returns. Jimmy left Carol Falls right after high school and spent years roaming the country, going from job to job. He’s got a bit of a chip on his shoulder and, at first, I wasn’t sure why. Then, in a flash, it came to me. He’s always felt like an outsider. All because of a secret he’s been hiding his whole life. I love it when characters have secrets. It’s fun to press their buttons – to see how far you can push them and to what lengths they’ll go to conceal whatever it is they’re hiding. TO KILL A MOCKINGBIRD. And, yes, I’ve read it more than once. I love the movie with Gregory Peck, too. The themes in this book really speak to me. The way Harper Lee uses childhood innocence to convey very adult messages is absolutely brilliant. And it doesn’t hurt that Atticus reminds me of my late father – with his wisdom and concern for his kids. It brings me to tears everytime. I think there will always be those books that are best in physical form. Picture books, for example, and hiking guides. Personally, I have a lot of cookbooks and I like to be able to crack one open and follow the recipe without my e-reader going into sleep mode. There’s nothing worse than trying to flick a switch when your hands are gooey. And I really like to see big color photos of the dishes – so I know if my renditions look right. LOL. Do you read all the reviews for your books? What was the best (or toughest) review you have ever had? I LIVE for reviews. I want to give my readers the best story I can and reviews let me know if I’ve accomplished that. I strove for ‘heart-warming’ with HOME FOR CHRISTMAS and, from the comments so far, I’ve managed to strike an emotional chord. Also, in this story, the heroine’s son is autistic and I did a lot of research to make sure I delivered an accurate and sympathetic portrayal. I’m particularly pleased with the glowing responses I’ve had from mothers of autistic children. Their real-life stories are truely inspirational. And if we, as authors, can transport our readers into another world, let them experience the life and emotions of someone else, then all the days, weeks and months of sitting alone at the keyboard typing, is time well spent. Before turning her attention to fiction, Roxy appeared in numerous TV commercials and movies, and ‘tread the boards’ in theaters from New York to Newfoundland. 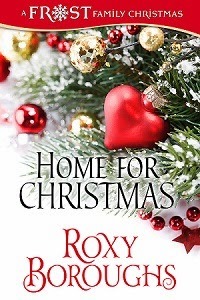 In addition to HOME FOR CHRISTMAS, and the free short story LETTING GO, she’s also published two romantic suspense titles, the award-winning A STRANGER’S TOUCH and its sequel, a romantic comedy called CRAZY FOR COWBOY and the sweet romance anthology STORIES OF CHANCE ROMANCE with Brenda M. Collins. Check them all out on her Amazon Page.